Thomas was driving the Discovery when he and Cath picked me up at the crossroads at 9am and we collected Isobel at Sandhead from where he drove directly to Corsewall. His car was the best one for the purpose – others who arrived a bit later got a bit bogged down on the soft ground and had to have help in getting extricated! I was too late to take photos as I had immediately set off to take photos around and about as the waves were crashing over the rocks throwing up some very photogenic surf! 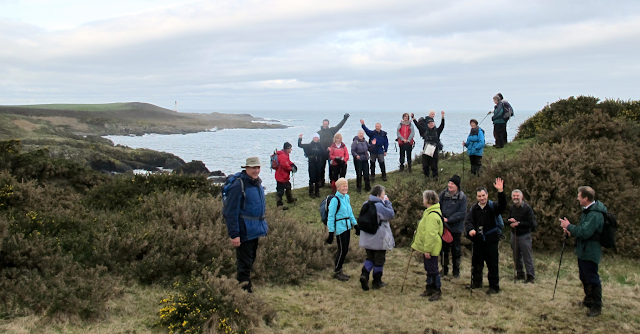 A dry but slightly overcast morning saw 21 walkers gather at the parking area by Corsewall lighthouse for the walk to Kirkcolm. 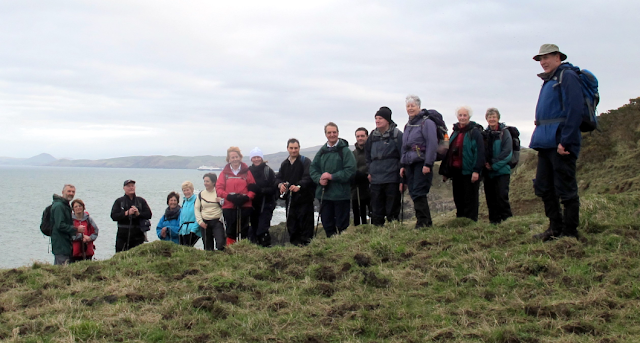 It was a good crowd who had turned out for today’s walk, including Catherine Makepiece, Carl and Shona who had not walked with us for months, Jim, who led the walk, Richard, the backup leader, Mary, Alex, Peter, Ken, Margaret, Audrey, Rachel, Linda, Leslie, Mary (Cairnryan), Duncan and Charlotte. 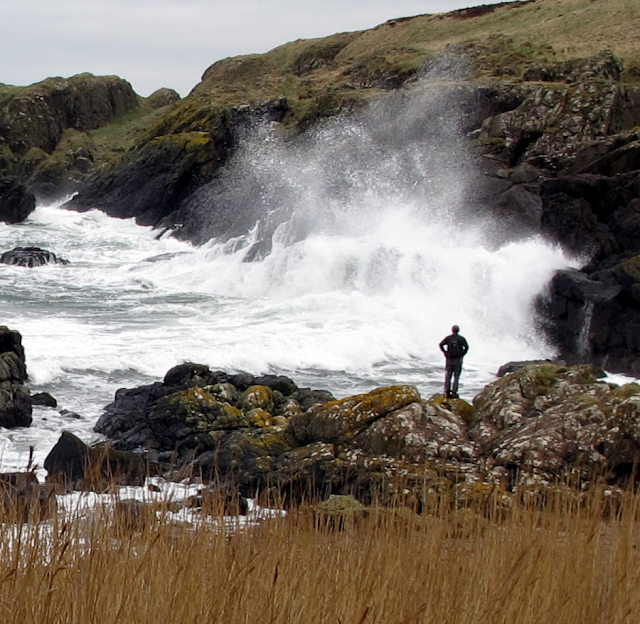 Although there was little wind, the incoming tide created spectacular waves to the delight of the group’s photographers; this was a feature for much of the walk. 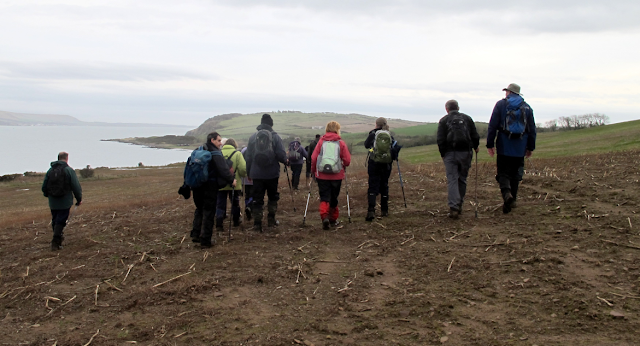 From the walk start to the entrance to Loch Ryan at Milleur Point the going was varied and testing. Though designated as a coastal walk, there is no apparent path. Muddy cattle tracks, rocky clambers and scrambles, steep grassy inclines, burns, and bogs were the order of the day and progress was steady. Picturesque waterfalls created a pleasant diversion from the rough terrain. Iron Age forts at Dunskirloch and Caspin were passed en route. 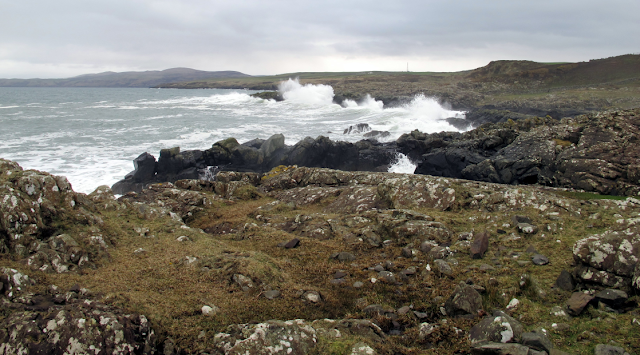 Also en route at Port Mullin, was the now derelict cottage once occupied by Bernard (Barney) McGhee. An item from the Free Press 12th of January 1905 read "Death of Nonagenarian. Kirkcolm has lost its oldest inhabitant by the death of Bernard McGhee which took place at the Old Mill Port Mullen, on 2nd inst. Bernard had reached the advanced age of 95, and died on his birthday within a few yards of where he was born. For 42 years he occupied the Old Mill and acted as assistant keeper at Corsewall for 28 years. The deceased had been over 70 years a member of Kirkcolm Parish Church which he attended regularly as long as he was able to walk. He was much respected in the Parish." At Port Leen, the cart track used for transporting sea kelp was easily identified. Here too, a well built stone wall at the end of the track caused speculation as to its use. 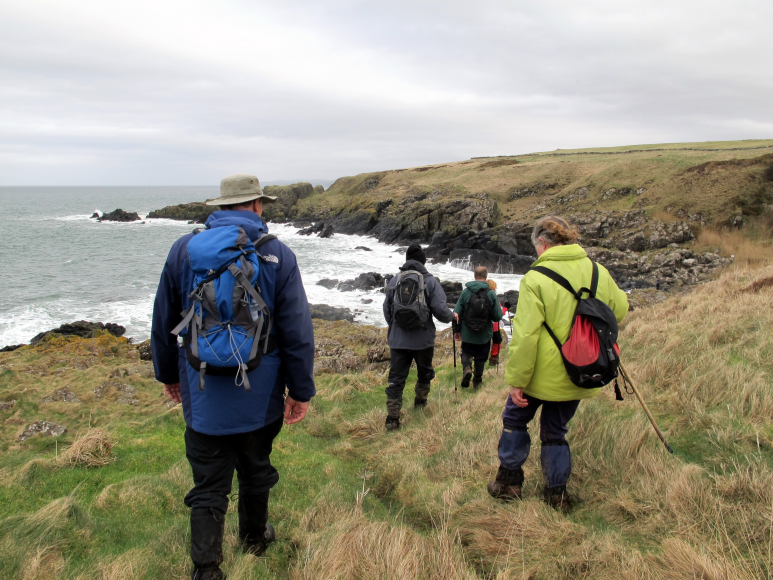 Celandine, primroses and coastal lichens were among the flora and fauna that added colour to the walk. 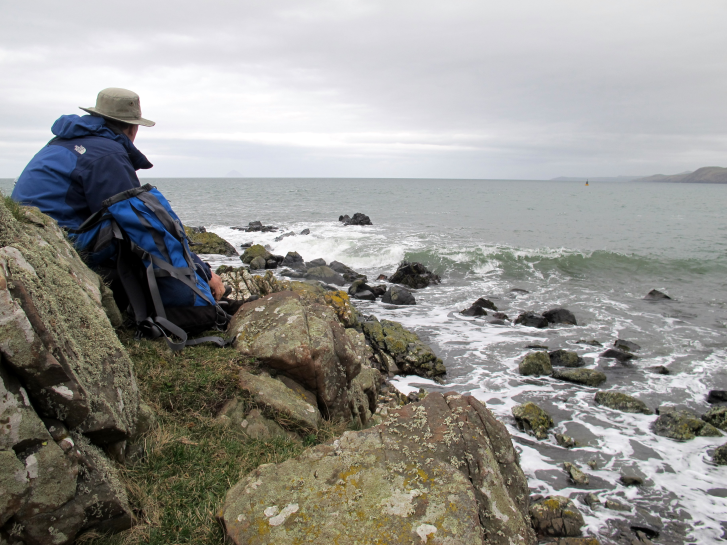 Among the sea birds spotted were gannets, shags, herring gulls, oyster catchers and curlews. Fox, deer, hare and rabbits also made an appearance. 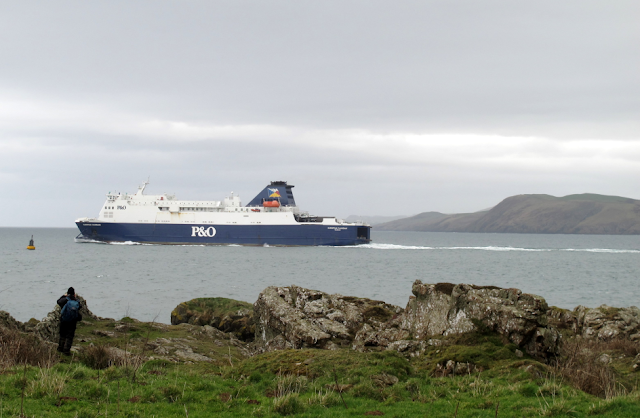 Ferries in and out of Loch Ryan were rarely out of the picture. Distant views were often non-existent, but at various times Ireland, the Mull of Kintyre, Arran and the Ayrshire coast put in an appearance. Rounding Milleur Point, lunch was taken on a rocky outcrop on the shoreline of Loch Ryan, where pleasant views over to Finnarts Bay were enjoyed. I constantly had to catch up with the others as I had to tear myself away from taking photos of the sea, surf and rocks. It was the most amazing day during which I purred constantly. The constant interest of the surroundings and the varying surfaces over which we walked kept me occupied for hours but it was a great relief when we did at last stop for lunch some time after 1pm. Despite the occasional dishing out of sweets my blood sugar level got very low after noon! The spot chosen for the lunch break was a good one from where to see the comings and goings of the ferries. 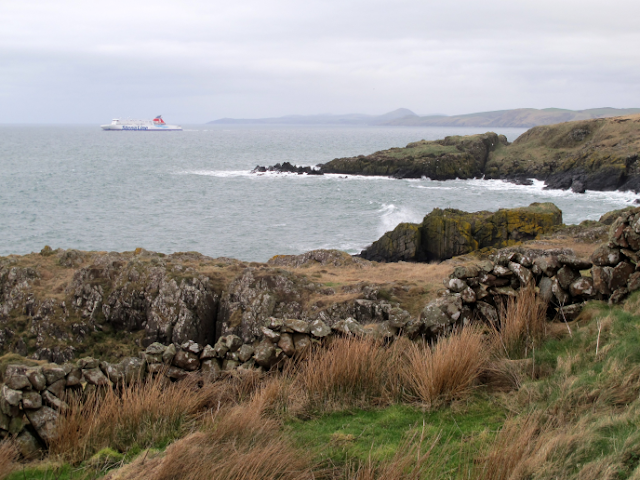 After lunch and with a close up view of the P & O ferry, the European Causeway, the cliff top path south was taken. Crossing the geological features of the Beef Barrel and McMeckans Rocks, Lady Bay was reached. A large flock of noisy geese flew overhead. 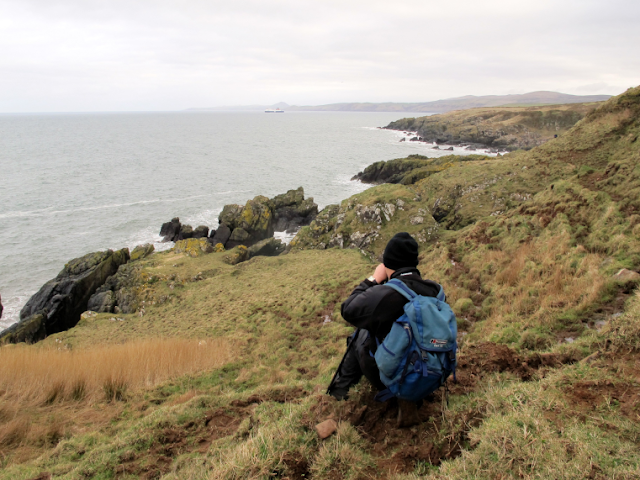 A sandy beach, a track and a winding rocky path were now followed past the bothies at Portmore to reach Jamieson's Point and Portbeg. Sometime during the day those of us trailing towards the back were delighted to see two deer chase between groups of walkers and fly over the dyke and bounce away up the field. I was too slow to get a reasonable photo of them but we were rewarded very soon afterwards when another deer followed the first two and I got a couple of ‘so-so’ shots of it. It was really good to cross the field cleared of last year’s maize crop – so much easier than going around the field when the crop is at full height! We turned down into Lady Bay instead of up and away from it as we have done in the past and then crossing the bay over the sandy beach before leaving it for another track. The walk was completed by road, uphill past Clachan Hill Farm, then downhill into Kirkcolm. Drivers were now ferried back to Corsewall to collect the cars. 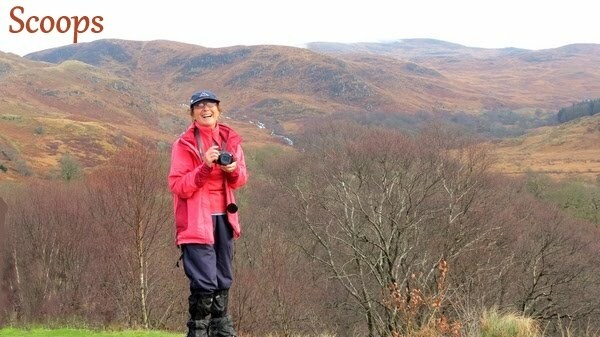 A testing but visually delightful walk was topped off with tea and cake at the Soleburn cafe. Some of us carried on walking, opting not to sit and wait for the drivers. I walked with Isobel who was now struggling to walk with two very sore knees, brought on, she said, by the Country Dancing she had enjoyed all last weekend at Pitlochry. She and I were delighted when Mary slowed down to pick us up, her car not having been needed to ferry any drivers and we got to Soleburn long before more of the party. Then we were delighted to meet Irene who had been waiting for us. We had not seen her for a very long time following an operation in February. We sat with her, enjoying her company until the other walkers arrived and we dragged all the new tables and chairs together, making a jolly crowd with lots of noise! We put all the furniture back afterwards and cleared the tables. We complimented the new managers of the tea room on the quality and quantity of their cakes – we shall go there again!